The town of New Bern, North Carolina, located approximately 40 miles inland from the coastline along the Neuse River, has recorded storm surge greater than 6 feet above ground level for more than 24 hours in a row. The Neuse River is a saltwater river that empties into the Pamlico Sound in coastal North Carolina, and storm surge levels exceeded 10.0 feet last night in the town of New Bern during the high tide cycle. A rapid-deployment U.S. Geological Survey (USGS) tidal gauge captured the storm surge as it traveled nearly 40 miles inland from the coastline upstream in the Neuse River. 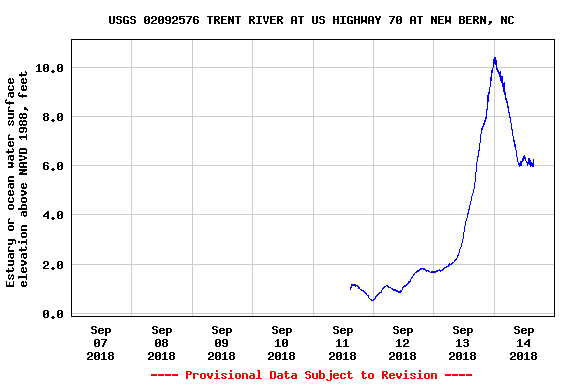 The tidal gauge was located along the Trent River, which empties into the larger Neuse River, at Highway 70 in New Bern. Earlier yesterday afternoon, the storm surge began to pile up along the coastlines of North Carolina. 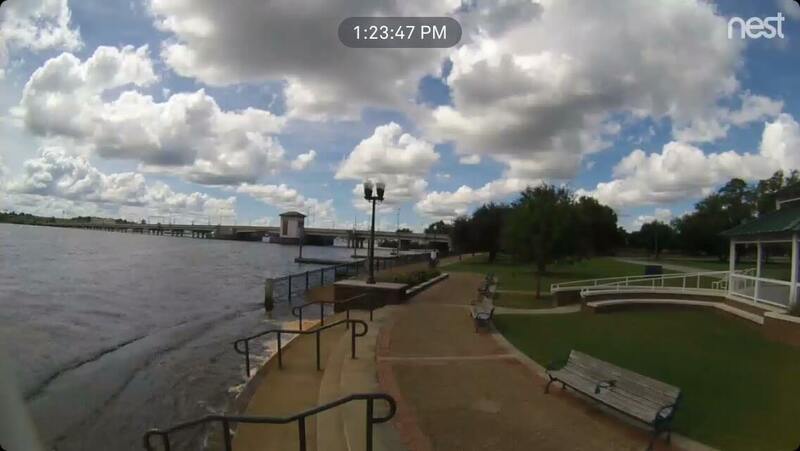 A before-and-after photo from a webcam at Union Point in New Bern between 1:23pm and 5:18pm EDT captures the incredible rise of the Neuse River due to storm surge, and this was approximately 6 feet of storm surge based off the time comparison of the webcam photo to the nearby tidal gauge. A webcam view at Union Point in New Bern, North Carolina, at 1:23pm EDT on September 13th. 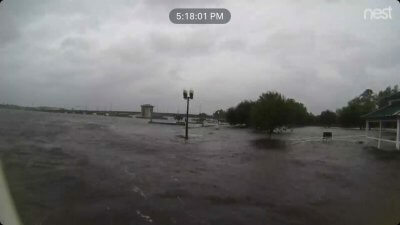 A webcam view at Union Point in New Bern, approximately four hours later with major storm surge pushing into the town. The storm surge would later surpass a devastating 10 feet of inundation above ground level during the evening of September 13th as the high tide cycle arrived. There were numerous water rescues according to local authorities, and these rescues are still being attempted as of 4:00pm EDT, due to storm surge levels that are still above 6 feet of inundation. 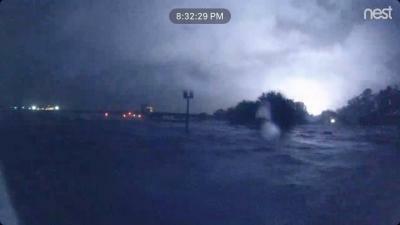 Webcam view of the storm surge in New Bern, North Carolina, at 8:32pm EDT on the evening of September 13th. Video from a local news source from an adjacent town to the north of New Bern showed video of the massive surge pushing into the town of Belhaven, North Carolina, last night. Catastrophic freshwater flash flooding, and major storm surge, will continue for the rest of the day across the majority of eastern North Carolina and the coastlines, as well as portions of northeastern South Carolina. The latest updates from the National Hurricane Center are being updated hourly on Hurricane Florence. Updates on the flash flooding can be found on the Weather Prediction Center‘s website, in addition to your local news and radio outlets. For the latest information on storm surge, you can follow the National Hurricane Center’s Storm Surge Unit on Twitter at @NHC_Surge. Tagged Hurricane Florence, Storm Surge.